Rep. Van Taylor announced today that he is supporting Rep. Ken Paxton for Texas Speaker of the House. The other person who have filed to become Texas Speaker are Rep. Warren Chisum, and the incumbent Texas Speaker, Joe Straus. “The Speaker of the House of Representatives is one of the most powerful and influential political figures in the state, vested with the responsibility of overseeing the course of lawmaking in every area of possible interest to any Texan.” Texas Federal Court Judge, Lee Yeakel. What are the actual powers and duties of the Texas Speaker of the House? Click here. Here is the statement we released yesterday. AUSTIN, Texas, November 23, 2010 – Today, Liberty Institute attended the Texas House Ethics Committee meeting in which the committee Chairman, Chuck Hopson (appointed by Straus) and the committee heard claims of political revenge in the Speaker of the House race and redisctricting process. When the hearing began, Rep. Larry Phillips (R-Sherman) was named as the Texas House member who allegedly told Rep. Bryan Hughes (R-Mineola) that elected House members would be punished for not supporting current Speaker Joe Straus. Specifically, Rep. Hughes claims that Rep. Phillips said that redistricting maps were already being drawn to get rid of newly elected Rep. Erwin Cain (R-Sulphur Springs) and Rep. Dan Flynn (R-Van). The hearing was officially posted as a public hearing, but Committee Chair Chuck Hopson (appointed by Straus) announced that he would close the hearing and ultimately only allowed the public to hear ten minutes of committee discussions that lasted more than three house behind closed doors. Update!! : 12;48 p.m. House committee, chaired by Rep. Chuck Hopson (appointed by Joe Straus) emerges from closed/executive session, over three (3) hours later. Rep. Bryan Hughes speaks first, asks to be placed under oath and such request is granted. Rep. Hughes repeats the statements made in his letter early this month, stands by his recalling of what he heard Rep. Larry Phillips say (see Hughes letter below). Rep. Phillips said that Rep. Hughes statements about redistricting were false. Rep. Phillips says that no such redistricting maps are being drawn. Rep. Hughes says that Rep. Chisum and Rep.-elect Landtroop were also mentioned by Rep. Phillips regarding redistricting issues. According to Rep. Hughes, he was told by Rep. Phillips that Rep. Landtroop could be protected. 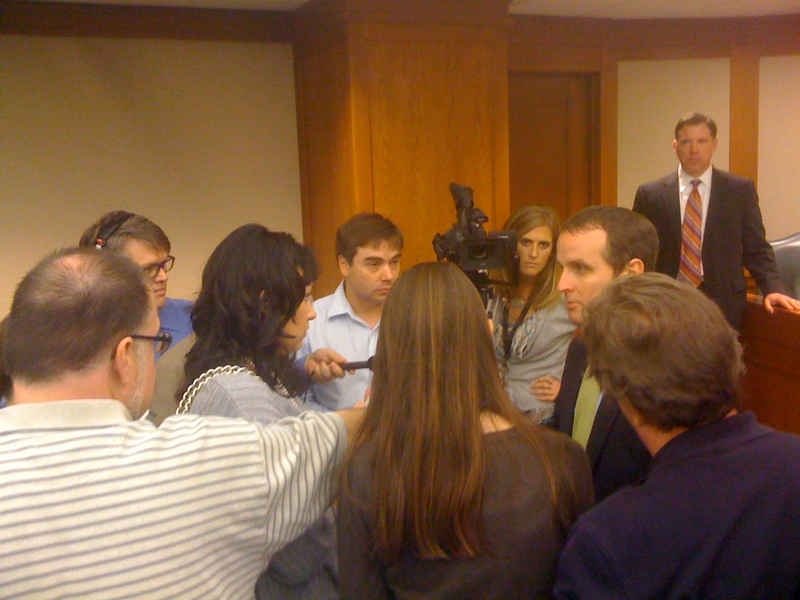 Following the ten (10) minutes of a “public hearing”, Rep. Hughes tooks questions from the media. Rep. Phillips immediately left the hearing room. Chairman Hopson (appointed by Speaker Joe Straus) concludes not enough information at this time to make any decision about misconduct. Hearing adjourns. Rep. Hughes stated to the press that he called Rep. Phillips before he sent out his letter with such allegations in question. See Hughes letter below. We’re at the Texas Capitol, at the House General Investigating and Ethics Committee hearing, regarding allegation made related to Speaker Joe Straus support. The committee came to order briefly. Present were: Chairman Chuck Hopson (appointed by Straus), Rep. Creighton, Rep. Hunter. Rep. Larry Phillips was named as the Texas House member that Rep. Bryan Hughes said called him and discussed how a redistricting map was already being drawn to get rid of Republicans Rep. Erwin Cain and Rep. Dan Flynn as punishment for not supporting Joe Straus for Speaker, but that Rep. Hughes would be safe as long as he supported Straus. 1. Rep. Larry Phillips has recused himself from the committee hearing, as he is a member of this committee that is conducting the investigation. 2. The hearing would limited to the one purpose, the allegations made in Rep. Hughes’ letter. I assume this means the Rep. Hopson has backed off his efforts to investigate people’s free speech activities, who dared give their opinion about the Texas Speaker of the House race. We’ll see. Hearing is technically not over yet. 3. The hearing would take place in private, and the public and media would be shut out of the important discussions between Rep. Phillips, Rep. Hughes, and the House committee. We are still in the hearing room and we await the return of the committee members and Rep. Hughes from Chairman Hopson’s closed session. New video opposing Straus has surfaced. Add six (6) more names to the list of House member and members-elect who have now decided to vote against Speaker Joe Straus and are now supporting Rep. Ken Paxton. The newly elected State Representatives adding their names to the Paxton support list are: Cindy Burkett, Bill Zedler (formerly on Straus support list), Charles Perry, Jim Landtroop, Kenneth Sheets, and David Simpson. Today, Liberty Institute delivered a letter to all the Texas State House of Representatives members and members-elect explaining their legal right to communicate with their constituents on the Speaker of the House race. On Monday, Rep. Hopson sent a letter telling House members they could be breaking the law and risking jail time if “influence[d]” by their constituents on who the next the Texas Speaker should be. (SB 182) passed the Senate on May 1st and took almost a month for it to reach the House Calendar. When it did (May 26th), it was too late. Quorum Report is reporting that the Texas House Republican Caucus is considering taking a “straw poll” on whether or not the Republican Caucus should have a caucus vote, to select the next Texas Speaker of the House. Last session, the Democratic Party essentially selected the Texas Speaker of the House, even though the Democrats did not have a majority of the House members. The current Texas Speaker, Republican Joe Straus was only able to secure a pledge of 11 Republicans and received support from 65 Democrats, which gave him the 76 votes he needed to become the Texas Speaker of the House. Many believe that because Republicans have the majority of the House members, that the Texas Speaker of the House should be chosen by Republicans, and not have Democrats essentially choosing the Republican Speaker of the House.